Art and Adventure: Level Up! In addition to fireballing, I also got a plus two to bardic knowledge! Dungeons and Dragons references aside, I'm always hesitant to post things like this because I know my mom reads this blog. But sometimes you just have to throw caution to the wind, you know? I've been trying to add some new tricks to the ol' bag lately. 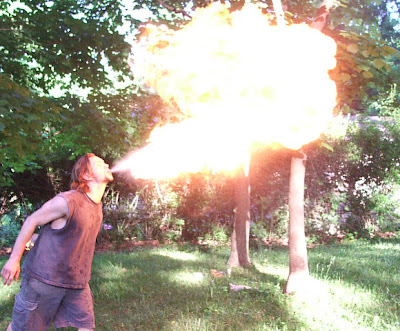 Fire-breathing seemed like the next logical thing, and I've been reading about how to do it for a long time. The other thing I'm working on is juggling four clubs. This is difficult and frustrating. Particularly with toddlers running around under your feet.